A dessert dish made from thick (or often solidified) custard, fruit, sponge cake, jelly and ice cream. A very colourful rpudding made with layers of fruits, cake and jelly etc. Chocolatey, gooey cake in the crockpot, so easy and SO good. A very easy and sweet recipe of Unday Ka Halwa. 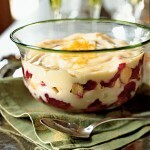 A dessert made with eggs and considered as one of the comforting desserts in winter. A thick and creamy milkshake that is so good it will make you have it again and again. Try this Crunchy Walnut Toffee recipe.You can substitute walnuts with any nuts of ur choice.I bet it wont last too long. A tasty blend of yogurt and fruits.